In teaching speed and sprint technique one can not rely solely on sprint drills. Sprint drills are good for teaching technique and they help develop genera coordination and dynamic mobility. In the video below Coach Ron Grigg of Jacksonville University discusses what he feels is the single best drill to produce carryover from drills to great sprint mechanics. The Wicket Drill developed by Vince Anderson (Texas A&M) requires force application and thus is more effective in good sprint mechanics. Coach discusses why the drill is important, shows clips of the drill being executed and discusses how to progress your athletes in the drill. 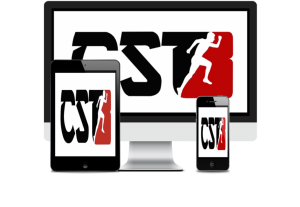 The clip below is from Compete Track and Field, a great resource for track and field coaches. This video and can be found,along with many other great coaching videos, on their YouTube Channel. The YouTube video below has sound, so please make sure that your sound is turned on and that you have access to the site. Some school block access to YouTube. The Wicket Drill consists of 6 progressively longer acceleration strides. These require that force be applied to the ground in order to produce momentum and velocity. After completing the 6 acceleration strides, the athlete will run “through” a series of 6-inch banana hurdles or wickets placed at ever increasing intervals. In order to do this drill the athlete must apply force. The wickets provide a peripheral reminder and give feedback to the coach and athlete. The coach can progress the athlete by simply changing the number of hurdles or increase the spacing. It is important to note that wicket drills are helpful to distance runners, jumpers and hurdlers as well. All of your athletes can benefit.